I love chicken! Chicken is my favourite meat and in my house we have it at least two to three times a week. Its such a good source of protein and if cooked in a healthy way a great compliment to your daily veggies and salads. This recipe is great for a light and healthy but filling meal perfect after a busy day or as a post-gym meal and its a winner with the kids! 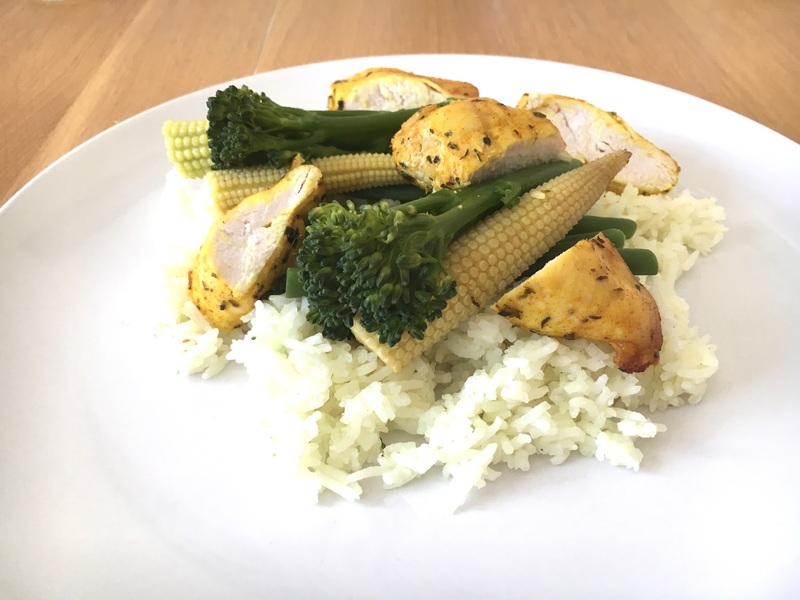 Here is my recipe for a quick and healthy Turmeric and Oregano Chicken served with Basmati Rice and Steamed Vegetables perfect for the whole family.. In a bowl pour a few large tablespoons of olive oil and add the turmeric and oregano and mix together. Add the chicken breast and mix well, cover and leave to one side to marinate. Meanwhile, wash the rice in a sieve and the vegetables in a colander and leave to one side. In a steamer prepare the water and put on the cooker, while waiting for the water to come to the boil, place the chicken on to a grill tray and place on the middle shelf in the oven and cook for 20-25 minutes until the chicken is cooked through, turning the chicken half way. When the chicken has been cooking for about 10 minutes, in a saucepan fry the rice for a few minutes and add the organic vegetable stock and stir. Then add double the amount of water compared to rice used (one cup rice, two cups water) and bring to the boil, then simmer until rice is cooked, stirring occasionally. At the same time as the rice, add the vegetables to the top part of the steamer and steam the vegetables until soft. Once the chicken is cooked place on to a chopping board (I will warn you Turmeric stains) and slice the chicken into large sliced chunks. Thank you Gemma 🙂 It is so easy to prepare and make!